Shorts Time? Go Find Out This Weekend! Put some dollars in your pocket and head to a farmers' market this weekend. Winter markets are all around, and the growers still have locally grown goodness for you. Your dollar will circulate in your local community economy, generating $1.40 - $2.60 in more local economic activity. No, I don't know how, but here's some good information about it. The kind of circulation I understand is "stir until well mixed." But in any case you can get good food, cheer a local grower or two, and probably see some other winter-hardy friends. 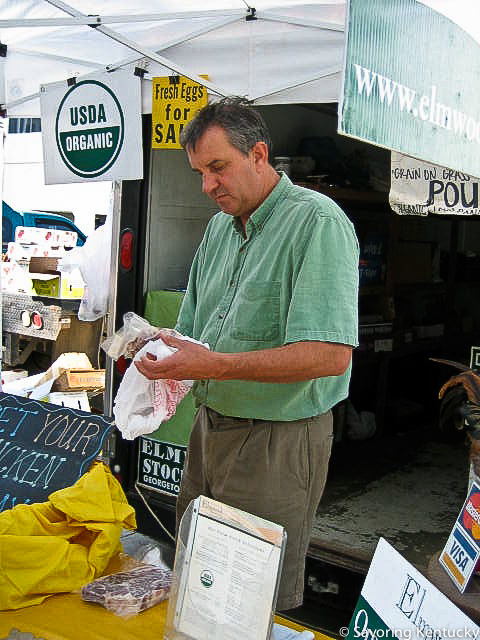 At the Lexington Farmers Market, with temps expected to be in the 50s, I'm guessing Mac Stone of Elmwood Stock Farm may even break out his famous shorts! Whatever he wants to wear! He can adopt purple speckled tights and a tutu if he wishes—he has earned the right to dress however he wishes. Mac, Ambi, and their faithful crew have been at the Market this winter through snow, ice, sleet, and freezing rain. They bring the certified organic everything. They are my heroes. Sponsors included in this post: Elmwood Stock Farm. See more sponsors here and in the site footer.